I’ve been asked if I learned about sushi while living in Japan (I didn’t) and I’ve been asked if I have too much free time (up for debate). But most of the questions I get are about the ingredients I recommend for making authentic-tasting sushi at home. Where to shop? What to choose? How to store? How to use? “How to use” naturally warrants a book’s worth of answers, but the shopping and selection tips are compressible enough to fit into a single post. Be warned that my preference is for top-quality natural raw ingredients that contain raw ingredients and nothing more. Sometimes this means I seek out specialty shops or place special orders, often spending more to get... my kind of less. 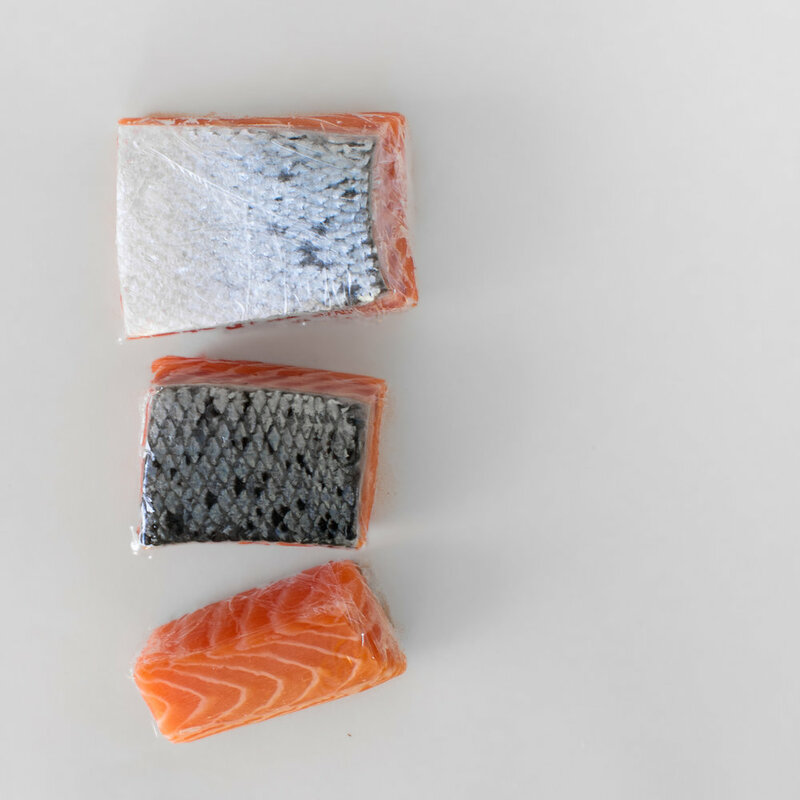 If, like me, you like your food clean and slow—you may find that using some or all of the following ingredients is the secret to achieving amazing sushi at home. The guide below matches ingredients—some specific, some general—with commentary based on my own sushi-making experience. Have fun, itadakimasu, and remember that most of the time, less is more. The right equipment is nearly as important as the right ingredients, though you can still make excellent sushi without a rice cooker, hangiri, makiyakinabe, oshizushihako, or oroshigane. In fact, the only piece of equipment you truly need (unless you’re making nigiri) is a simple bamboo rolling mat or, better yet, several—preferably in a range of complementary textures and sizes. Cheap and ubiquitous, these can be found at kitchenware shops, Asian markets, and the foreign foods aisle of most grocery stores. If you read the small print you’ll find that nearly all of the sushi rice available outside of Japan is grown either in Italy or in California. What’s important is that the best rice is from a new crop (old rice has poor texture) and that it’s a true short-grain variety—unlike some medium-grain rices marketed for sushi, including the ever-present Nishiki. Cooking rice to perfection is a challenge, and once you have more or less mastered a technique that works with one brand (and the same equipment, and the same amount)—you’re best off sticking to it. My favorite is Akitakomachi rice from Japan—a premium variety and the only Japanese-grown rice available in the Warsaw area. I don’t use a rice cooker: for me the wide-saucepan absorption method is the ticket. 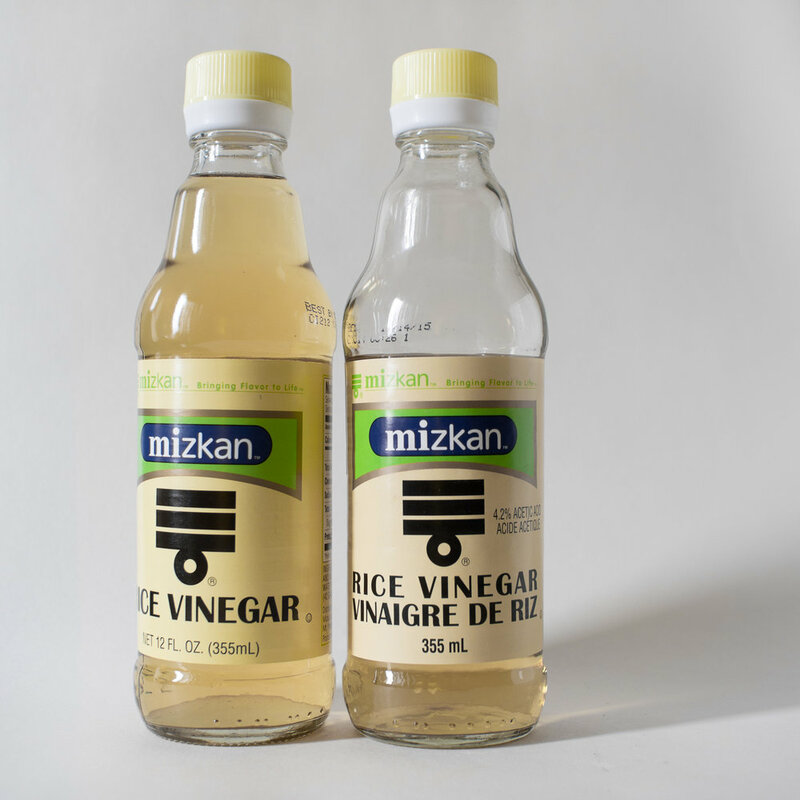 Rice vinegar is a staple in all Japanese cooking, including sushi su, the traditional mix of rice vinegar, sugar (or rice syrup), and salt that turns plain cooked rice into sushi. 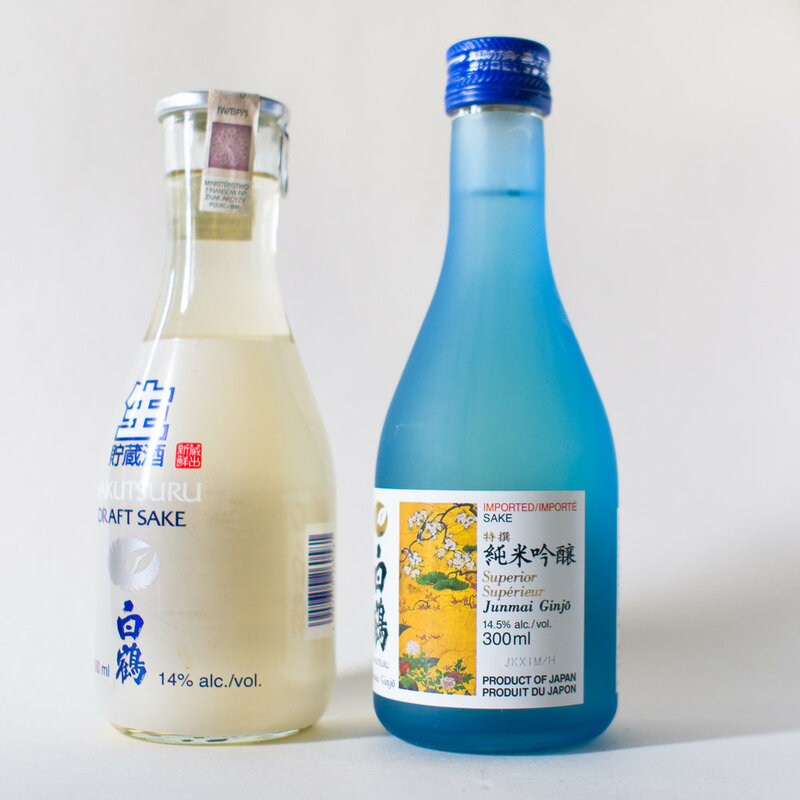 Make sure you’re getting the real deal, and not some harsh “grain-flavored spirit vinegar” or one of the many adulterated blends of “sushi seasoning.” Note that the acidity of the Mizkan product I recommend is a relatively low 4.2%. If the rice vinegar you’re using is stronger, use less or dilute it with a splash of water. Another interesting option is naturally brewed brown rice vinegar: amber-colored, healthful, and deeply aromatic, it’s an acquired taste worth acquiring. Nori sheets are made out of pulverized porphyra algae, purple-red in its natural state, in a process similar to the production of paper. Contrary to what some gaijin believe, it’s not the nori that makes the sushi—it’s the rice. Nevertheless, nori is the essential wrapper for all kinds of maki—and lower-quality sheets tend to tear. Whichever brand you’re buying, get the “gold” variant: each time I’ve tried “silver” nori—or a non-graded brand of nori sheets, even high-priced ones labeled as organic—I’ve been disappointed. Store nori in a dry place, along with the original dessicant packet it came with, and never reach into the package with wet hands. I deploy two heavy-duty zipper bags to keep my economy supply nice and crisp, which is an attainable goal in low-humidity Poland. I’ve tried all the available organic brands, including Clearspring, Lima, Arche, and Yakso, and of course I’ve tried Kikkoman, as well as some pricey artisanal kinds of shoyu and tamari imported from Japan. My favorite? Yamasa. I even confirmed this with a blind test. Available at all the Asian shops, and many regular supermarkets, it’s the clear winner, not just in terms of flavor, but also with regard to the availability/consistency principle. 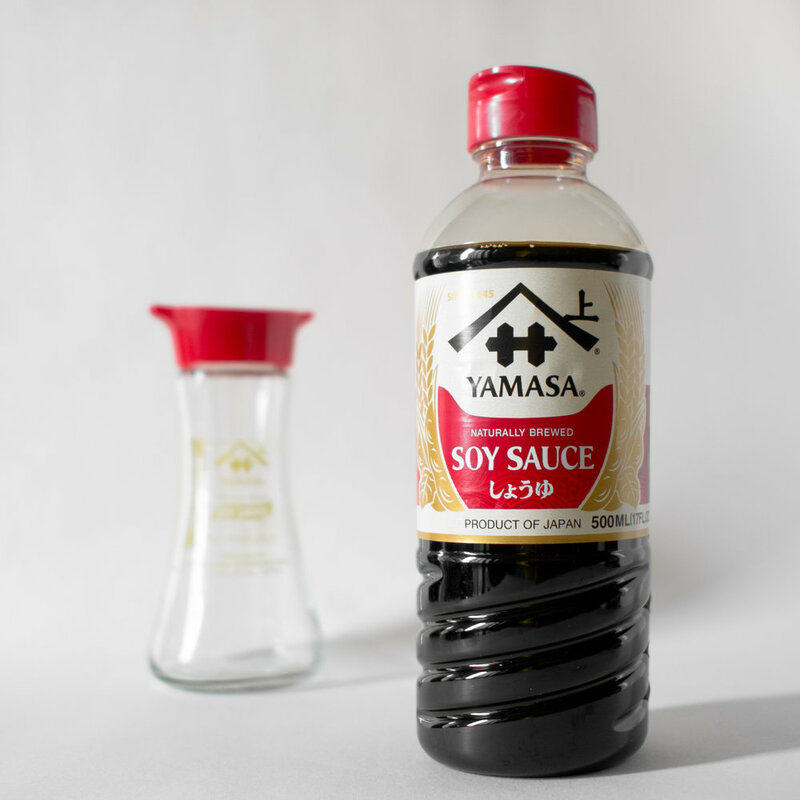 The half-liter plastic refills are perfect for my needs—and the small 150 ml glass pouring bottle is reusable and great for serving a meal’s worth of shoyu at the table. I’m a big fan of the smoky, nutty richness of toasted sesame oil. Ever since I tried the luxurious version from La Tourangelle, I can’t go back to the acrid flavors of the Woh Hup and Tao Tao versions (and even the disappointing, if beautifully packaged, alternative from Marks & Spencer). But La Tourangelle products are usually impossible to find around Warsaw, and I don’t have a sensible source online. Luckily, the Carrefour version is excellent and always available. It’s organic, it’s inexpensive, and it looks great poured into that pretty La Tourangelle container I’ve been keeping around. Shown here is my go-to Asian sweet cooking wine. Yes, it’s expensive—but it’s incomparably better than the rest of what’s available. In fact, in my experience, bad mirin is worse than no mirin, so if I can’t get the good stuff from Terrasana, or another naturally fermented sweet rice wine, I’ll improvise with sake and rice syrup, or even sub in a regular white drinking wine (which, in my case, is bound to be German, Austrian, or French). Sometimes I sip some gently warmed sake while making sushi, and maybe that’s enough of a reason to consider it an essential sushi ingredient. If I have an open bottle in my fridge, I add a glug of it to the cooking water for sushi rice. And if I’m out of the only mirin I think is worth using, I’ll use sake and rice syrup, or sake and sugar, in classic preparations such as ohitashi, tamagoyaki, and teriyaki sauce. In Warsaw, the selection is pretty limited, so I buy what I see. The one in the blue bottle is described as superior to the more basic one on the left, but I’m not sure I can tell the difference. The pull-tab carafe brings back memories of Japan, but the screw cap on the Junmai Ginjō has more functionality. The mauve pickled apricot—ume—is a decidedly Japanese specialty. Its fruity and salty sour tang can be found either in the fruit itself (a traditional tsukemono that’s usually pickled with another Japanese classic, shiso leaves) or in paste form, or in the pickling liquid known as ume su. While it is entirely possible to make sushi without ume, it’s a fact that nothing else will add zing to an avocado in quite the same way or make a bento filled with plain rice look like the Japanese flag. I stick to the organic brands because conventional ones are loaded with junk. 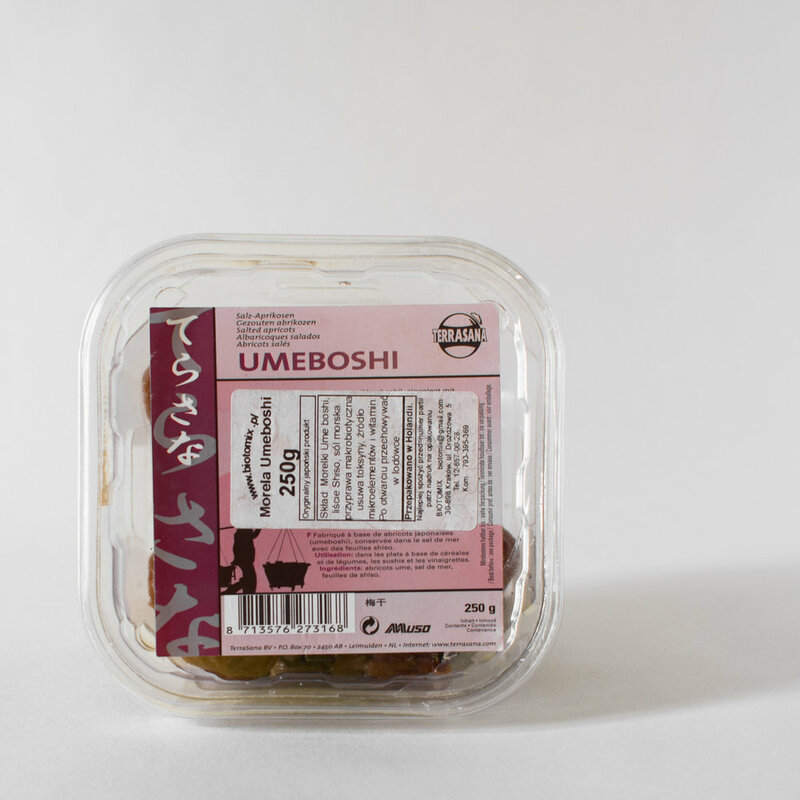 Pickled ume keep for years in the fridge and are a macrobiotic miracle cure for headaches. Did you know that the green paste known as wasabi almost never contains any actual wasabi? Still, whether it comes in a tube or in powder form, it’s a respectable ingredient in its own right, made with plain European horseradish root and green dye. I search vigilantly for powders that contain only natural ingredients. My favorite, from Clearspring, actually contains 10% true wasabi—but it’s expensive and hard to find. A good substitute is the Kona brand, with no true wasabi but the respectable addition of spirulina and turmeric. It lacks the Clearspring’s complexity and reconstitutes into a smoother paste that’s a brighter, lighter shade of green. It’s a great second choice—at a third of the price. Ever since I read the list of ingredients on a jar of sushi ginger, I’ve been making my own. Because I can’t find young ginger in Warsaw (and have failed so far at the reportedly easy task of growing young rhizomes in soil), I use mature ginger, sliced paper-thin across the grain and marinated in the usual mix of rice vinegar, water, and sugar. The resulting gari is both more fibrous and more spicy than the stuff in the jars, yet most people discover that they like it. Note the jar of pickled daikon radish (know as takuan) next to the ginger. Stinky, crunchy and sweet, this is another love-it-or-hate-it mainstay of Japanese food. I make some of both every few months for storing in the refrigerator and using as needed. If I run out of homemade sushi ginger, I don’t serve it at all: a high-acid off-dry white wine is an equally good palate cleanser and digestive aid as the original. Shown here is an additive-free mix of sea vegetables (to use a term I find more appetizing than both seaweed and the Polish glony) for reconstituting in water and mixing up into a condiment-slash-salad with nothing but some sugar, plenty of toasted sesame oil, a dash of salt, and a garnish of pan-roasted sesame. While this can be used to fill gunkan maki, I usually just serve some in a bowl for sharing at the table. Because I learned to like this dish while living in Copenhagen (and learning the basics of sushimaking from my dear friend Marta), I have taken to calling it tangsalat. Tang—now there’s a way to say algae that whets the appetite. Here are two positively exotic ingredients that combine to form dashi, the lightning-quick stock that is the essence of umami flavor—and the basis for most of Japanese cuisine. Strips of kombu are nature’s number one source of glutamic acid. Katsuobushi flakes are richly smoked paper-thin shavings of dried, fermented, and smoked bonito fillet or, better yet, skipjack tuna. I don’t bother with instant dashi of any kind, because the authentic version is also pretty instant and the ingredients are readily available. Entire cups of dashi go into Japanese soups and stews—but on sushi night I might just make several spoonfuls for the tamagoyaki. I repurpose kombu by cooking it again with the rice and then I add it, julienned, to the shiitakes or the sea vegetable salad. Much of sushi is fish-free, but when there’s fish it is the star of the show. Generally, I keep things simple by pre-freezing portions of a top-grade salmon fillet (which I purchase farmed-in-Denmark or wild-from-Scotland from Happy Fish at Bazar Olkuska). I fridge-defrost what I need over several hours prior to assembling the sushi, cleanly carving my slices before the fish is fully thawed. I use the trimmings in a negitoro-style salmon tartare, hand-minced and seasoned with soy sauce, the juice of grated ginger, sesame oil, and chopped leek, scallions, or red onion. In addition to salmon, I also like to use cooked shrimp, scallops, or monkfish to make fat futomaki rich with avocado and mayo. If you’re in Warsaw and feeling adventurous, check out the Fish Lovers pop-up markets for a truly special catch of the day. Sesame, or goma, is delicious when toasted and easy to find both at health food stores and wherever ingredients for sushi are sold. The black seeds owe their color to pigments in the fiber-rich outer seed coat. The white seeds come in both hull-free (“decorticated”) and hull-on varieties, with the former more delicate in flavor and texture and the latter more rugged and less prone to scorching. I’m currently stocking black sesame, for sprinkling onto light-colored foods and grinding into gomashio, as well as its finer-textured no-hull white cousin, for all other uses. Mix and match with different foods to find your favorite combinations. Keep in mind that sesame is oil-rich and prone to spoilage: buy small amounts and keep in a cool, dark place to preserve freshness. When I first tried shiitake mushrooms that had been simmered in a mixture of mirin and soy sauce, I liked neither the musky aroma nor the fleshy texture. But repeated exposure has made me a convert, and these days I nearly always include shiitake hosomaki on my sushi menu. Dried shiitake (sometimes also called poku) can be found at any Asian market. Choose fat, small ones with pretty crevassed tops and intact gills. Store your shiitake in a jar with the original “do not eat” packet to absorb moisture. Use two or three dried mushrooms per skinny roll. It’s easy: reconstitute in water, discard stems, slice caps thinly, and simmer along with a splash of the soaking liquid and small amounts of mirin and soy sauce (or sake, sugar and soy sauce) until the liquid is syrupy and mostly absorbed by the mushrooms. I occasionally swap the simmering for overnight marinating to preserve the mushrooms’ legendary health benefits, which are said to diminish upon exposure to heat. Avocados are the creamiest, most indulgent vegetable (okay, fruit), especially if you go for the nearly black, pebbly-skinned veriety known as Haas. A ripe avocado yields to pressure but still offers resistance. Watch out for ones that are too soft, which are likely to be brown with rot and inedible. Some avocados seem perfect but aren’t—like a corked wine, they reveal themselves to be spoiled just as you’re about to serve them to your guests. So get extra. An avocado can turn quickly, even when refrigerated. Buy avocados when firm and, don’t leave out to ripen for too long. Use a sturdy knife to slice in half vertically. If you’re using only half—don’t lift out the pit and drizzle the exposed flesh with lemon juice or ume su to reduce discoloration caused by oxidation, then wrap tighly in plastic and refrigerate until needed. You can also store your cut avocado in a covered container with a piece of raw onion, which emits a gas that prevents browning. To pit cleanly, use your knife and a little force to bury the sharp edge of the blade in the pit: it will lift out easily, still attached to the knife. When rolling sushi with avocado, breathe deeply: it’s slippery. Eating sushi with chopsticks is strictly optional. In Japan, folks often pick up nigiri and slices of maki with thir fingers, using their ohashi—chopsticks—for mounds of ginger or seaweed salad instead. Just make sure to use only the back ends of your chopsticks to transfer foods from the communal bowls to your plate—and that you stick to putting the regular ends in your mouth. Clever and hygenic, right? Just like the Japanese.